PC Tech Associates is a computer consulting firm that provides computer services to small businesses, home-based businesses and individuals. Their unique approach to computers provides clients with not only the tools to get the job done, but also the understanding of how technology can assist them to become better organized and more efficient. 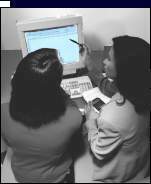 PC Tech Associates provide small businesses with a resource for computer assistance, a benefit once available only to corporations. "Small businesses and home-based businesses have special needs but require the same support as large corporations," says founder, Karen Simon. She believes that, "given the right tools and proper training, computers can give us more time to enjoy ourselves in both our work and home life." Founded in 1994, the company has been actively involved in numerous small-business networking groups in Los Angeles and Honolulu including Chambers of Commerce, LeTip International and the National Association of Professional Organizers. "We don't work with just computers all day. We work with the people who use them!" - Karen Simon, President, PC Tech Associates.